The Chicago Blackhawks have a golden opportunity at hand. If they pull out a victory, it doesn’t matter if it is in overtime or not, they will be in the driver’s seat going into game six. 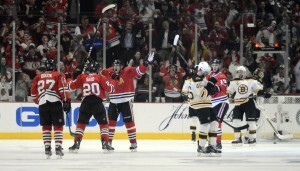 Last Wednesday, the Blackhawks withstood all they could against the Boston Bruins. Even though the Blackhawks won the game, I am still a little worried about the amount of penalties that lead to the power-play goals that kept Boston in the game. That cannot happen if the Madison Street Hockey Club is going to win game five. Expect for Coach Joel Quenneville to keep the team in line. Also, the power play woke up from its slumber. Even though the team scored a short-handed goal, it was a good start to getting off the snide. Taking advantage of Boston’s physical play can lead to opportunities for the Blackhawks. Let’s see that if carries over to tonight’s game. Don’t be surprised if a goal that was scored via the power play is the difference in being up one game and being down one game. Corey Crawford is much maligned by Blackhawks fans. In their eyes, the fact that the goals Crawford gave up all came from his glove side. Some even wanted him benched for tonight’s game in favor of Ray Emery. I won’t spend too much time on that because it’s not going to happen. Look for the visitors to try to exploit a perceived or even alleged weakness. The Bruins might go to that if they are losing at any point in tonight’s game. As much the Bruins might exploit Crawford, the Blackhawks might be on to something regarding the Boston Bruins’ most imposing player. Have the Blackhawks figured out Zdeno Chara? Chara is a menacing, defensive stalwart. Just as advertised. In game four, he was on the ice for every single goal scored. That is something for the Blackhawks to hang their hats on. If they think they figured (Chara) out, they should try it again. He’s going to be good and ready. They should try again tonight. The Blackhawks have gained some confidence now that the series goes back Chicago. The Boston media said the same thing after the Bruins won game two. That goes to show you that the Stanley Cup Final is pretty even between the two Original Six teams. Hockey fans, media members and the players alike are getting their money’s worth thus far. This is the best thing that can happen to the National Hockey League after the lockout-shortened season. One of the advantages that the Blackhawks seem to have over the Bruins is team speed. The home team has faster skaters. That alone can help when it comes to puck possession. The more a team controls the puck, the likelihood of said team putting the puck in the back of the net increases. I expect the Chicago Blackhawks to win tonight’s game five.